Springfield, MO ? Saturday morning, September 17 at Panera Bread on South Campbell, over 230 runners participated in the ADA 5K Stop Diabetes 5K. The weather was cool and rainy, but that didn?t stop these runners from supporting a great cause to help to STOP Diabetes! Race Director Shannon Cochran stated, ?Today was our 3rd annual 5k with American Diabetes Association. Our youngest child, Olivia, was diagnosed with Type I Diabetes at 20 months of age. We have been actively involved with the local ADA since then. We had a great turnout this year and the rain held off making for a wonderful event.? Joplin, MO ? Great weather, beautiful scenery, Technical Shirt, Awards, Ice Cream, Hot Dogs & Fireworks made the Dash to Bash 5K at huge success. 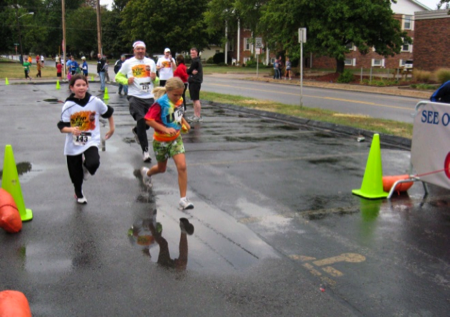 The Dash to Bash 5K was the 1st race in Starlit?s Running Fall Race Series. Runners who participate in all 3 will receive a CUSTOM FINISHER'S MEDAL. The next race Twilight Thriller Costumed 5K/10K and 1 Mile Fun Run is scheduled for Saturday, October 29, 2011 at 6:25pm (Frisco Trail, Joplin, MO), followed by the Legs and Lager 5K/10K and 1 Mile Fun Run Saturday, November 19, 2011 at 5pm. A portion of all proceeds goes to SWMO Running Camps. Springfield, MO -- Friday night, September 2, 2011 over 200 runners and walkers participated in the NAMI Illuminating the Darkness 5K to help raise awareness for suicide prevention. The participants wearing glow-in-the-dark apparel lit up the Ozark Greenway's South Creek trail while spectators and volunteers cheered them on at the finish line. The Nixa Running Group took home the trophy for the largest group with 29 members. Josh Steele (Pleasant Hope) and Rebekah Epps (Springfield) were the Overall Male and Female runners finishing with the time of 16:42 and 23:34 minutes respectively. Joplin, MO (ActNow) - The Blue Moon 5K & 10K run was held Saturday, August 13, 2011 at 8:15 at the Frisco Greenway South Trailhead in Joplin, MO. There was a great turn out at the event with over 250 runners. It was an evening trail run with tea candles lighting the way. There were tons of refreshments including FREE ice cream for all the runners at the finish! 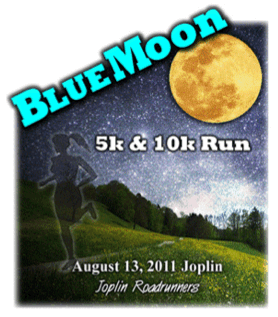 The Blue Moon 5K & 10K Run had 100% of proceeds go to families and/or individuals affected by cancer. The overall winner for the male division of the 5K was Jamie Burnham from Joplin with a time of 17:53, 2nd place was Tyler Schultz of Baxter Springs, and 3rd place was Matt Bennett was Joplin. In the female division, 1st place was Celeste Graves of Joplin, with a time of 21:12, 2nd place was April Brubaker of Joplin and 3rd place was Lauren Cassidy of Columbus. The overall winner for the male division of the 10K was Nathan Sicher with a time of 40:33, 2nd place was Brandon Smith of Neosho, and 3rd place was Uriah Allen of Carl Junction. In the female division, 1st place was Jenna Mutz of Joplin with a time of 44:57, 2nd place was Marissa Forth of Webb City, and 3rd place was Corie Hocker of Pittsburg. Updated 8/14/2011 10:30 AM - Race Results are now available below!